When I was a kid, I read some comic books. Not many, just Superman, X-Men, Archie, and Betty and Veronica, and maybe a couple others. And now I’m trying to get back into comics and graphic novels, and because I’m still a noob, I often don’t know much about the whole world of comics and graphic novels. Comic books are called graphic novels once several issues are bound together to make a larger volume. DC Comics have what is called the DC Universe (and Marvel might have this, too, but I’m not sure), where a lot of the characters interact in the same world. So, for instance, in Black Orchid, we see characters from Batman as well as Superman. I knew that there were individual comics that brought these characters together (like the Superman/Batman comics), but I didn’t realize that Batman might just pop up in another DC comic book. I’m a NOOOOOOB. I also think this is pretty cool. Anyway, so while reading this graphic novel, I didn’t realize that the Black Orchid was a character that had been around for a while in DC comics. I thought it was a new character brought to life by Neil Gaiman and Dave McKean. (See? Noob.) So when I finished, I thought, “Hmm, that was a cool story, but that’s it? We’re told she’s a superhero but we never even really see that in action!” But, of course, I didn’t know about all the other comic books featuring the Black Orchid. I really did like the storyline, and loved the art. I really liked how this story was about saving the Earth from climate change without being too political or preachy. 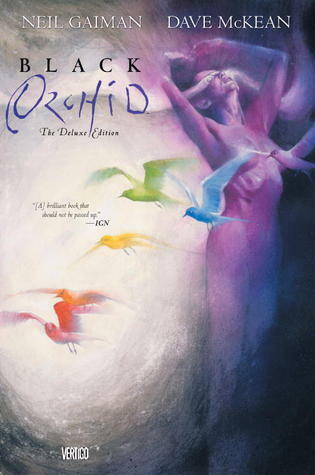 I’ve read other books that have a type of message and some of them come off as really political, but Black Orchid doesn’t fall into that trap. I also really liked all the extras in the copy I read. It had Neil Gaiman’s notes while writing the story, as well as letters from the editor, etc. I did find myself confused at times while reading the story, but perhaps that was because I’m really not familiar with the Black Orchid’s background and this whole DC Universe. 4 stars. I have always felt like more of a Marvel person, even though I like Batman and Superman, but after reading Black Orchid I think I’m definitely going to have to read more DC soon.